SAB Biotherapeutics, Inc. (SAB), a clinical-stage biopharmaceutical company, today announced that its anti-Ebola immunotherapy (SAB-139) provided “100% protection against a lethal dose of the Ebola virus” in a recent animal study published in The Journal of Infectious Diseases . The study was conducted by the National Interagency Confederation for Biological Research and other collaborators including United States Army Medical Research Institute of Infectious Diseases (USAMRIID) and the Naval Medical Research Center (NMRC). According to the World Health Organization, Ebola virus disease (EVD), formerly known as Ebola hemorrhagic fever, is a severe, often fatal illness in humans with an average fatality rate around 50%. Case fatality rates have varied from 25% to 90% in past outbreaks, and there is currently no licensed treatment proven to neutralize the virus. During recent outbreaks of EVD in West Africa, passive immunotherapy with convalescent plasma containing polyclonal antibodies from recovered patients was used as an effective treatment. However, the amount and availability of these medicines are limited by the number of survivors. 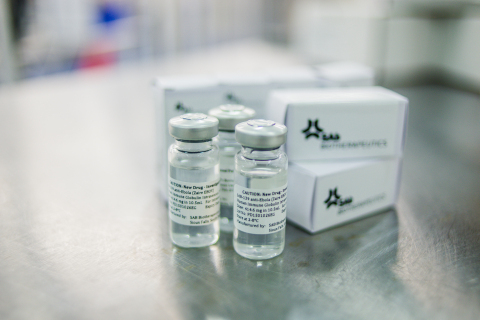 SAB-139 was produced from SAB’s proprietary DiversitAb™ platform utilizing transgenic cattle (Tc Bovine™) to produce large amounts of natural human, rather than bovine, antibodies in response to an antigen—in this case EVD. In the study, all animals treated with SAB-139 at one-day or three-days post-infection survived versus none of the control animals. In addition, the animals treated with SAB-139 exhibited no symptoms of EVD. To produce the immunotherapy, Tc Bovine were vaccinated with the EVD antigen. Within a brief period of time, they produced significant amounts of fully human antibodies to combat the virus. Plasma was then collected, in the same way it is collected from human donors, and purified to isolate the antibodies that become the treatment. SAB Biotherapeutics, Inc. (SAB) is a clinical stage biopharmaceutical company leading the science and manufacturing of human antibody therapeutics. Utilizing some of the most advanced polyclonal antibody science, SAB is delivering the world’s first large-scale platform to create fully human immunoglobulins. This natural production platform holds the potential for treatment of public health problems, rare conditions, long-term diseases and global pandemic threats.